from Amazon @ $14.29 ea. The Pratt PRA0039 recycled corrugated cardboard single wall standard multi-depth printer's box is made of 100 percent recycled, 32 ECT grade, single wall, C flute corrugated fiberboard with standard kraft color in a rectangular shape for packing, shipping, and storing. The box has a 32 edge crush test (ECT) value. ECT grade corrugated cardboard is constructed, tested, and graded for compressive strength, which is a useful quality for stacking; ECT values are measured in pounds per inch, and range between 23 and 112. This box has multi-depth creases at 2" intervals from the top. The corners of the box can be cut down to a crease line, and the creases folded to make the box shorter. The flaps will be longer, but can overlap when closed, so no material needs to be removed from the box, and the original size can be restored if needed by taping the cut corners. The printer's box shape fits reams of North American letter size and A4 size paper. This regular slotted container (RSC) is shipped knocked down flat (KDF) to reduce shipping costs and storage space, and can be assembled by taping the bottom flaps. When assembled, the box measures 11-1/4 x 8-3/4 x 6 inches (L x W x H). (L is length, the horizontal distance on the longest side; W is width, the horizontal distance on the shortest side; H is height, the vertical distance from top to bottom). Multi-depth scoring provides alternative heights of 4 and 2 inches. 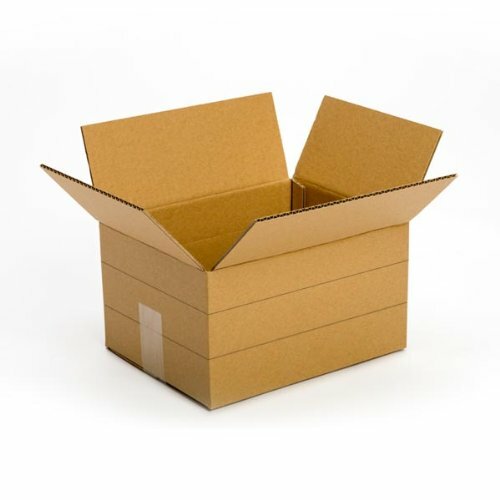 Corrugated cardboard boxes are used for packaging, shipping, and storing goods and materials. Corrugated cardboard consists of two pieces of stiff paper with a layer of fluted, or wavy, paper in between. Double and triple wall corrugated don't necessarily have twice or three times the strength of single wall. Single wall consists of a flute layer and two liners. Double wall is made by adding another flute and liner to single wall, so it has less paper than two single walls would. Some multiple wall corrugated materials use different flute types in the second or third wall. Flute type refers to the shape and thickness of the wavy middle layer. From thickest to thinnest, the types are: A, C, B, D, F, E, and N.
Pratt Industries manufactures recycled packaging and display solutions. The company, founded in 1948, is headquartered in Conyers, GA.